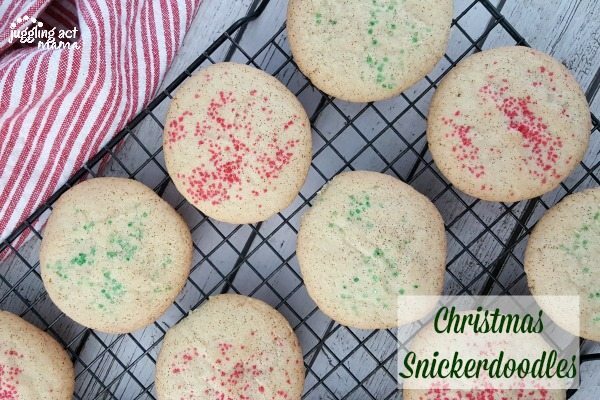 Our Christmas Snickerdoodles are perfect for Santa and his elves! Grab our recipe for Christmas Snickerdoodles below. This post has been sponsored by LorAnn Oils. This post contains Amazon Affiliate links. All opinions are my own, but I only promote things that I love and think you will love, too! This does not increase the cost to you, but does help support Juggling Act Mama. For more information, please see our Disclosure Policy. I know you’re wondering what a baking emulsion is, right? It’s a flavor suspended in a base containing mostly water. Traditional baking extracts are flavors suspended in a base containing mostly alcohol. LorAnn Oils Bakery Emulsions are not compromised by the flavor of alcohol and don’t “bake-out” when exposed to heat like an extract flavor. You can use these anywhere you would a baking extract – in cakes, cookies, cheesecakes, frostings and more. You use bakery emulsions just like you would a baking extract. 1 teaspoon bakery emulsion = 1 teaspoon extract. Today I’m taking my favorite Christmas Snickerdoodles to the next level by adding LorAnn Oils Bakery Emulsions Cinnamon Spice to the recipe. It bumps up the flavor of the cinnamon, making these the best Snickerdoodle cookies! Now here’s a quick time-saving tip about making Christmas cookies. This is a big batch of cookie dough, so I like to take half of the dough and freeze it for another time. Just spread the dough into a log on parchment paper, then roll up and twist the ends to secure. Slide it into a resealable bag and label it. During the month of December, I often make a large (or double) batch of cookies when I h ave a few minutes, and then freeze part of it. On Christmas Eve, I can pull it all out of the freezer and quickly make a variety of cookies for Santa without making a giant mess. Preheat the oven to 350-degrees F. Line a baking sheet with parchment paper and set aside. In the bowl of an electric mixer fitted with a paddle attachment, cream together the butter and sugar. Add the eggs in one at a time, beating in between. Mix in the Lorann Oils Bakery Emulsions Cinnamon Spice . Sift in the flour, baking powder and salt and mix on low until combined. In a small bowl, mix together the sugar and cinnamon for the topping. Using a medium cookie scoop for even portions, shape the dough into a ball, then roll in the topping mixture. Place on the prepared baking pan about 1-inch apart. 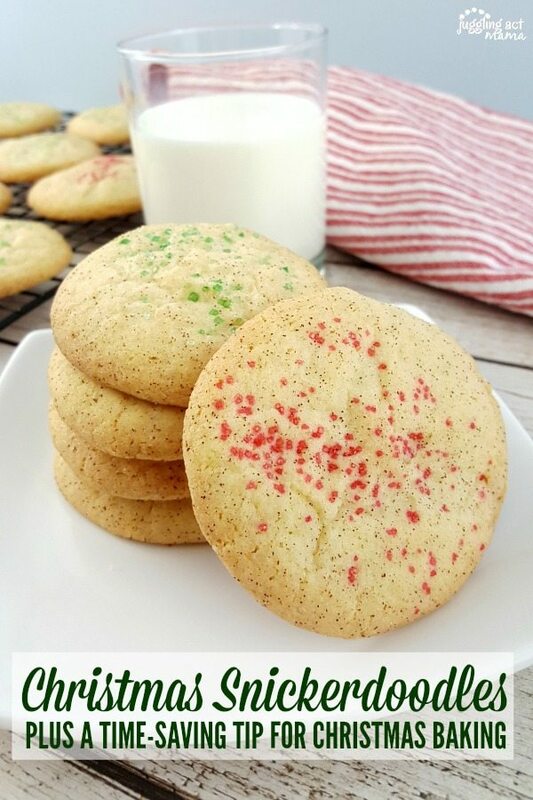 Sprinkle the top of each cookie with red or green sugar for a festive holiday look. Bake for 12-15 minutes until the edges are crisp and the cookies and golden brown. Let set on the tray 1-2 minutes before removing to a cooling rack . Store in an airtight container for up to 1 week. Ok, so it’s time for today’s giveaway, now! 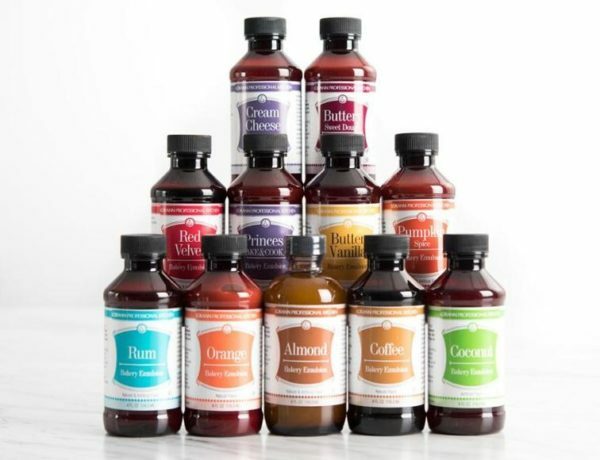 One lucky reader will win (10) LorAnn Oils Bakery Emulsions, including the following flavors: Red Velvet, Almond, Lemon, Peppermint, Buttery Sweet Dough, Princess Cake & Cookie, Strawberry, Cinnamon Spice, Coffee, and Coconut. Thank you for such a great giveaway! I’d love to try the almond and orange emulsions. They would be so perfect for my baking!! The Red Velvet and Cream Cheese set looks nice! I would love to try the almond emulsion. It is not an exotic flavor but one that makes some recipes just perfect. My passion is baking and my favorite flavor is lemon but I have to say, the Princess Cake & Cookie emulsion has got my curiosity piqued. Now, if I had my eldest son standing behind me, I would have to say his favorite flavor which is Blueberry emulsion. The Butter Vanilla sounds amazing! Love baking and especially love eating!! Love Almond, Coconut and Cinnamon Spice. Can not wait to try your Snicker-doodle recipe. They are my absolute favorite cookies! The coffee variety is the flavor I am most interested in trying. I would love to try the coconut emulsion. The strawberry because I’m excited to use it for frostings. I would like to try the BLUEBERRY, BAKERY EMULSION. I’ve never heard of it before. I would like to try the butter vanilla or the blueberry ones. Those are new flavors for me. Yum! I love a snickerdoodle cookie … I’ll have to try this recipe. I’ve never used baking emulsions before. Definitely need to check these out! The almond, lemon, orange emulsion. Butter Vanilla, Bakery Emulsion my pick !!!! So many choices,but I think I would love to try the buttery vanilla and the cinnamon . It’s hard to choose just one, so I pick the Butter Vanilla Emulsion because both of these flavors elevate the delicious taste of baked goods. I want to use it in my Sugar Cookie Dough which also has 1/4 cup of sour cream to jazz it up a notch. I Love all these oils. The pumpkin spice sounds fab! So many recipes I’d use this in! I’ve recently discovered that I love to bake! I’d love to try the Princess Cake & Cookie one!! I’m most looking forward to trying Cinnamon Spice! I’m really love spicy flavors. I’d most like to try the Buttery Sweet Dough Bakery Emulsion. Thanks. definitely the orange! love the smell and taste of orange zest! I’m most interested in trying the Coffee flavor! Thanks! I use a lot of orange so that is what I am looking forward to ! I want to try the Raspberry bakery emulsion. I bake..A LOT. I use of orange, cinnamon & vanilla flavorings mostly. Would love to try an emulsion over an extract. Looking forward to the chance! I want to try the Princess Cake & Cookie. My husband is selective about baked goods. I love to cook, but he’s watching his weight. I’d love to tempt him with the coconut or rum emulsions. If he’s going to indulge in something I make, I want it to really be worth is for him. I’d like to try their cinnamon spice emulsion. Butter Vanilla sounds great. I think it would be fantastic in baked goods. I am really looking forward to trying the banana one. I love lemon flavored anything. I’m really interested in trying out the Almond and Coconut flavors first.